1. Jared Freadrich, Portland Winterhawks: Portland Winterhawks defenceman Jared Freadrich recorded a goal and three points Sunday in a 6-5 loss against the Seattle Thunderbirds, but still had a major impact on the ending of the 2018-19 WHL Regular Season. 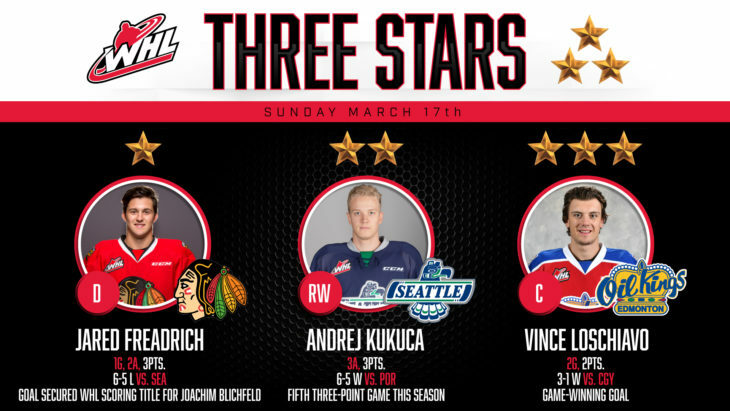 Freadrich’s last-second power-play goal earned an assist for teammate Joachim Blichfeld, making the latter the 2018-19 WHL Scoring Champion. The Camrose, Alta. product finished his regular season with 48 points (15G-33A). For his WHL regular season career, Freadrich had 131 points (38G-93A) in 263 games. 2. Andrej Kukuca, Seattle Thunderbirds: Seattle Thunderbirds forward Andrej Kukuca had three assists Sunday in a 6-5 win against the Portland Winterhawks. Kukuca assisted on the fourth, fifth and sixth goals of the game for Seattle. The Trencin, Slovakia product completed his 2018-19 WHL Regular Season with 57 points (25G-32A). 3. Vince Loschiavo, Edmonton Oil Kings: Edmonton Oi Kings forward Vince Loschiavo wrapped up the regular season portion of his WHL career with a pair of goals in a 3-1 win against the Calgary Hitmen. Loschiavo scored the first two goals of the game for Edmonton. The Winnipeg, Man. product had 62 points (37G-25A) this season and 174 points (95G-79A) in 318 WHL regular season games. The Edmonton Oil Kings rolled to their 11th-straight victory Sunday to close out the 2018-19 WHL Regular Season, earning a 3-1 win against the Calgary Hitmen. Just like Saturday’s game in Edmonton, Calgary went ahead 1-0 with the only goal of the first as Riley Fiddler-Schultz provided his fourth of the season, quickly redirecting a pass from Cael Zimmerman. Edmonton, or more correctly Vince Loschiavo, would strike back in the second. The overage forward ripped a pair of one-time shots past Carl Stankowski on the power play to quickly put Edmonton up by one. An empty-net goal by Jake Neighbours would be the only offence in the third. Todd Scott turned aside 25 of 26 shots for his 11th victory of the season. Stankowski stopped 33 in the narrow loss. Captain Trey Fix-Wolansky (Columbus Blue Jackets), Quinn Benjafield, Conner McDonald, and Scott Atkinson each had a single assist in the win. 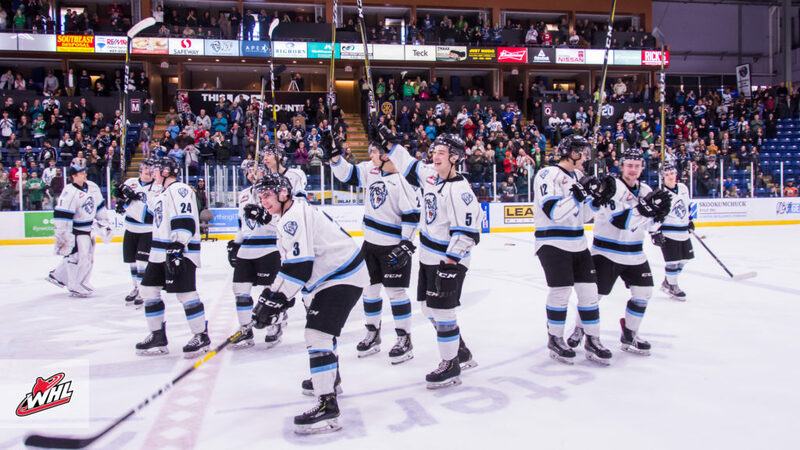 Michael Milne broke a 4-4 deadlock with 5:44 left in regulation as the Kootenay ICE won their final home game in Cranbrook, B.C. Earning a 5-4 decision against the Red Deer Rebels, the deciding goal completed a multi-point game for Milne, matched by Jaeger White with a goal and an assist too. White opened the scoring, but the Rebels roared back with three-straight goals, scored by former ICE skaters Cameron Hausinger and Brett Davis. Hausinger would strike for two of those goals, including 19 seconds into the middle period, making it a 3-1 lead for the visitors. Kootenay would have a response though as Nolan Orzeck, Holden Kodak, and Connor McClennon all found the back of the net in 105-second span to put the ICE back into the lead 4-3. Jordan Borysiuk would tie up the game late in the second with the first goal of his WHL career, but Milne would come through with the only goal of the final period to cap off the win. Curtis Meger stopped 25 shots for the ICE to collect the win. Brad Ginnell added a pair of helpers in the win. A last-second goal by Jared Freadrich secured the 2018-19 WHL Scoring Title for Joachim Blichfeld but wasn’t enough to secure a win as the Seattle Thunderbirds earned a 6-5 victory in Oregon Sunday. A seven-goal first period saw the Winterhawks holding onto a 4-3 lead. Seattle tied the game up in the second and then won it in the third. Six different Thunderbirds scored in the win while Jarret Tyszka (Montreal Canadiens) collected a goal and an assist. Andrej Kukuca had three assists in the win. Freadrich finished with a goal and three points while Jake Gricius had a goal and a helper. The first goal of Kai Uchacz’s WHL career and rookie Jared Davidson scored for Seattle in the win. Simon Kubicek, Brecon Wood, and Sean Richards also scored. 2019 NHL Draft prospect Reece Newkirk, Clay Hanus and Seth Jarvis also scored in the narrow loss. Cole Schwebius stopped 40 shots to earn the win.